Apparently there was some controversy surrounding this film, as it looks at a legendary moment in Australian/New Zealand, first world war history (the Battle of Gallipoli) and sympathizes some what with the opposing army, highlighting that despite our casualties, they actually lost a greater number of soldiers in the battle. Personally I didn't have any issue with this. I like the fact that this film looks at the Turkish side of the battle and does explore some of the prejudices felt by Australian and Turkish soldiers borne out of their experiences in battle. 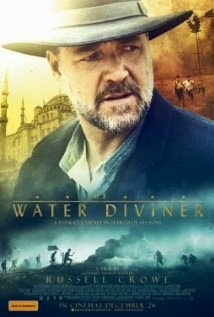 Anyhow... the film follows Connor (Russell Crowe) across the globe to Turkey, on a search for his three missing sons four years after the battle of Gallipoli. For him, it's a very eye opening journey with some unexpected allies. Given the material, this isn't really a film that I'd say I enjoyed but I didn't dislike it either. 'Enjoy' is just the wrong word. I found Connor's journey just as eye opening, interesting and engaging as it was for the character. For the most part it's a very understated journey but it always seemed to be moving forward with something going on to keep you invested in the story. My only disappointment was that Jacqueline McKenzie didn't have a bigger role in the film (I'm a long time fan of hers). Given that I never knew she had a role in the film in the first place it was a bonus to see her name come up in the opening credits. She's great in the small but important role of Connor's wife. I do question that Connor's intuition seemed a little too good at times. At one point in the film he is flat out asked about it and he completely ignores the question. I get that there is some parallels being drawn here with Connor's skills as a water diviner transferring into his search skills to find his boys but at a couple of critical times it seems a little too convenient that he just knows he's found what he's looking for. Beyond that though, it is a very good film. Russell Crowe's direction has produced a very watchable and grown up film that is very much about the journey but does reach a satisfying conclusion. I'd highly recommend it. You may even learn something about the first World War that you didn't know. I certainly did.